I can highly recommend Michele and her Team at Core Studios. Through a mutual friend we were introduced to Michele and Core Studios. Soon after meeting Michele, we came to an agreement that our staff would train at Core Studios in the morning, before starting their work day. Who would have predicted the amazing transformation that has taken place in less than one year? 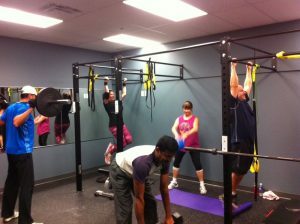 Our staff absolutely love working out with Michelle and her Team. The trainers work them hard – very hard. They come back from the work-outs having been challenged to levels they would have not have attained on their own – in a safe and comfortable surrounding. These are not athletes. Many of them had little or no previous work-out experience. To see their smiling faces, their healthy complexions, and to witness their new found pride is truly exciting. Nearly every morning I can hear each of them returning from the gym, discussing the workout they just accomplished, and how good they feel. People who worked together for many years, but never really communicated, are car-pooling to the gym together and patting each other on the back. There is laughter, there is energy, there is a good feeling in the room – it is a new work environment! Quite remarkable! Thank you Michele and the staff at Core Studio – you guys have really made a difference in people’s lives!